John McKee & Rebecca Wickersham McKee of Frederick County, Virginia and Later Highland County, Ohio – My 4th Great-Grandparents | "Limesstones"
My great-great-great grandmother was Mary McKee Limes. She married Harmon Limes on 25 Mar 1813 in Frederick County, Virginia. They came to Ohio around 1813 and first settled in Fayette County, Ohio and then they moved to the Highland County, Ohio area. 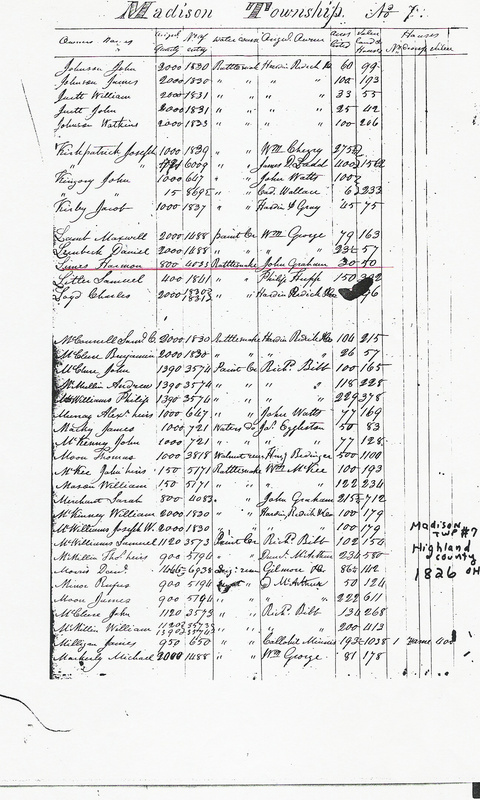 Harmon Limes is shown in the 1830 U.S. Census as residing in Highland, County, Ohio. John McKee and Rebecca Wickersham originated from Frederick County, Virginia and were married there by Rev. Alexander Balmain on 7 Aug 1792. Rebecca Wickersham was the daughter of Isaac and Elizabeth (Frazier) Wickersham of Frederick County, Virginia. By the early 1800’s, this McKee family had migrated to the Highland County, Ohio area. 1. Joseph (b. 1793) married Almira Hutchinson on 17 May 1826 in Logan County, Ohio. 2. Elizabeth (b. 15 June 1795) married Henry Waln on 8 Nov 1813 in Frederick County, Virginia. 3,4,5 Three unidentified daughters born between 1795 and 1799 – listed as living in Frederick County, Virginia in the 1810 U.S. Census records. 6. James (b. circa 1800) married Emily Chew on 18 Apr 1822 in Fayette County, Ohio. 7. Rebecca (b. 6 June 1804) married Thomas Young on 16 Sep 1824 in Highland County, Ohio. 8. Rhoda (b. circa 1811) married George Bennett 15 Feb 1827 in Highland County, Ohio. Harmon Limes, and the heirs of John McKee (who is believed to have died in 1825), are shown residing in Madison Twp. #7, Highland County, Ohio, by the water course of Rattlesnake Creek, per the 1826 tax records. The same is also true for the years 1830 and 1831. Reel #83, Order Book #36, Frederick County, Virginia – 1804-1805 – pages 437, 449 and 450 show William Limes,page 449, Atha Limes, page 450 and Margaret Limes on pages 437 and 449. This entry was posted in genealogy, Stories and tagged Limes. Bookmark the permalink.